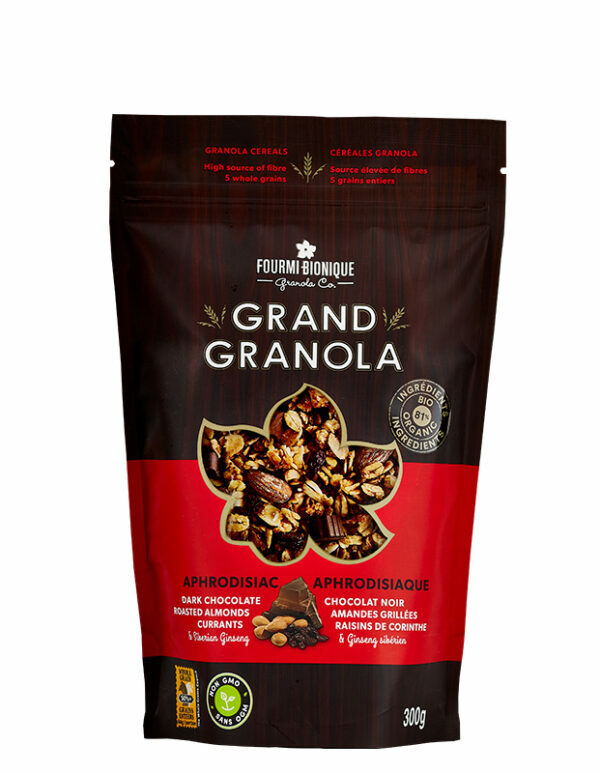 The Grand Granola Aphrodisiac is a an energizing granola blend made with organic cereals sourced from Quebec. 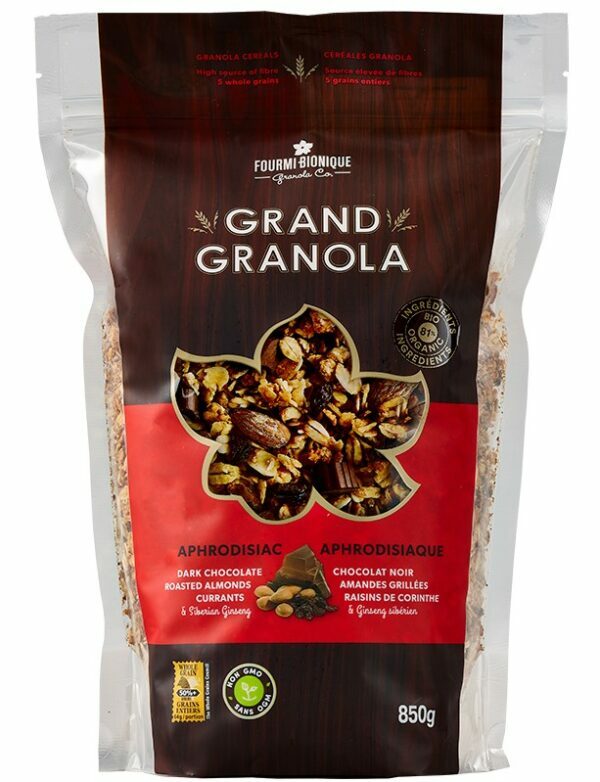 A very strong contender in this product range, this granola seduces with its bitter and sweet character, combined with the properties of the organic dark chocolate and Siberian ginseng. This blend made with high quality ingredients, wholesome and harmonious, goes particularly well with yogurt and fruit. Once in your hands, you will be able to give free rein to your imagination. For an extra source of inspiration, see our original granolas recipes! This product is available in an economic and recyclable bulk packaging. The Aphrodisiac is also offered in the NUTBROWN grain-free and gluten free granola range.. Rolled oats*°, Sugars (honey°, cane sugar*), Whole spelt flour*°, Sunflower oil and/or Canola oil , Dark chocolate*¹ (cocoa mass*¹, cane sugar*¹, cocoa butter*¹, whole cane sugar*¹, ground vanilla bean*¹), Rolled rye*°, Rolled barley*°, Oat bran*°, Tamari* (water, soybeans*, wheat*, salt), Coconut*, Currants (currants, vegetable oil), Almonds, Sesame seeds*, Flax seeds*, Cocoa powder*¹, Siberian ginseng*, Natural flavour. May contain cashews, hazelnuts, macadamia nuts, pecans, milk and ingredients made in a facility that processes peanuts. Bitter chocolate urges on the tartness of wild berries and roots, only to be soothed by deep roasted, candied, rich nuts.